In the ongoing series of "for some reason Thomas gets to review all his favorite season three episodes" we're at 'Heart of Stone,' which is one of the more significant installments for fans of the Odo and Kira relationship, but then again, as said above, not really. While hardly the strongest installment of the third season, this isn't one of those. The worst criticism I can think of here is that this is a reset button installment, as Odo is eventually manipulated into confessing his love to an entity that isn't really Kira at all, but rather the female founder he met during 'The Search,' and the real Kira is still left completely in the dark. However, what this does is essentially setting up the emotional motivation for Odo siding against his own people, which actually felt rather "off" beforehand, and generally speaking it's a great exposure piece for him and his way of thinking. I believe the show needed to spell out Odo's infatuation with his colleague strongly since Odo is a very aloof individual, it's often hard to know what he really thinks, and apart from that, the two don't even belong to the same kingdom. Kira's a mammal. Odo's a mineral, an "unknown sample," to quote the most elegant exposition of the episode, where Odo tells of how his "full name," Odo'Ital, is literally the Cardassian word for "nothing." 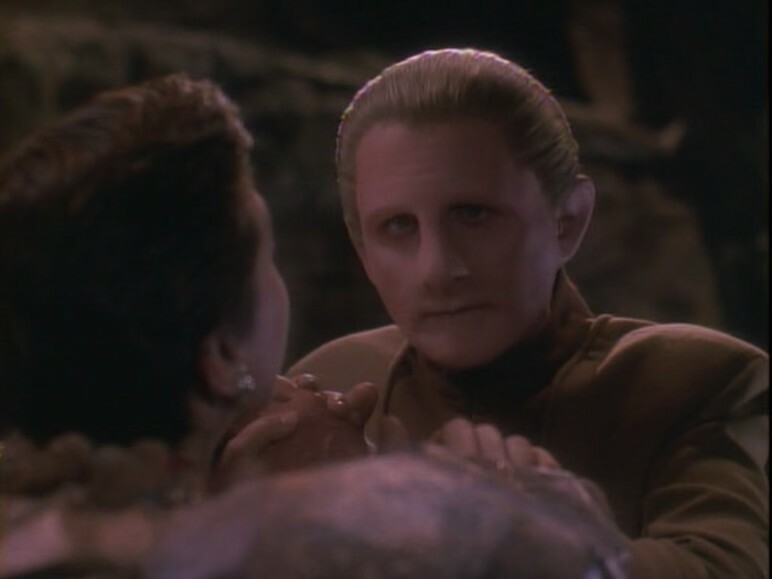 Come to think about it, this may even explain the title of the piece – quite literally, Odo has a "heart of stone." Maybe this is the weakest of the five episodes I've been assigned to review by some objective standard, but never the less it's one I enjoy a lot. The narrative might be a bit clumsy, and René is doing a far better job playing Odo than Nana does in playing Kira in this episode, if you exclude the beginning and the end, but... well, of course, the whole point of her performance here lies in that, and after all, this installment is mostly about Odo. The second story of the night is a fluff piece about Nog trying to convince Ben to recommend him for Starfleet Academy. Actually, comparing the two, at least Nog's plot is the one actually going somewhere in this episode, as... yeah, he's actually being serious. The teenage petty thief and swindler from the pilot episode is gone forever. While not nearly as dramatic or hard-hitting, it provides a bit of fun and levity to mix with a main plot that's really just two people in a confined space forced to talk to one another. Surely, though, there are worse ways to spend an evening than with Odo and Kira talking to each other. Even as an oldtime O/K shipper, I have to admit this episode ranks fairly low on my scale. The two stories don't quite mesh thematically and the climax, while providing a surprising twist, fails to satisfy emotionally. And knowing that Nana Visitor was having a hard time in her life just then and did not enjoy making the episode makes it an unpleasant viewing experience. This is one of my favorite episodes, as it kicks off two important arcs for the series. The O/K relationship is what saves the Alpha quadrant, and Nog deciding to join Star Fleet gets the DS9 writers to finally consider treating the Ferengis with some respect. The writers will botch the Ferengi storylines, many times, but occasionally they get to be seen as 3D characters instead of just caricatures. Agree that the two stories don't tie together, though.